Just wanted to let you know. I love your dyeing videos. I have never dyed anything, but you did inspire me to buy my first blank recently. 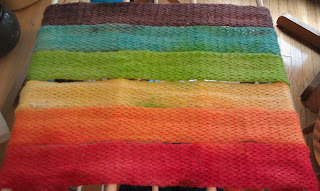 I am going to try dyeing as soon as I finished the baby blanket i am working on. Your hats and yarns look lovely! I love the way you organized your pictures. I can't wait for when my son is old enough to dye along with me. Soon, soon! I would love to see the project that became this gorgeous flavorful yarn!